“Are you clickable?” – We were reminded by Sheryl Nussbaum-Beach at a recent talk she gave at our school. She is referring to the fact that many employers will “Google” potential employees and so teachers today should be making students aware of this and showing them how to create positive online information about themselves. Step 1 is “lurking”. Just log onto the web 2.0 sites and start reading and watching so that you get a feel for what’s going on. I think “lurking” is an unkind term for what is really personal investigation and self-education. Step 2 is where you realise you have things to say and you find your own voice. This can be daunting especially for those of us who are reserved, and who perhaps like to give due consideration to our train of thought before we bleat it to the world. Step 3 is connecting with others online and this too can be a challenge. Each group tends to have their own language according to their field of interest and for those not quite involved it can feel exclusive: like a clique. It really depends how much you wish to immerse yourself in that group. I enjoyed hearing Sheryl speak but I felt my eyes begin to glaze over when she described how she set up virtual food for guests she had invited into her Second Life room to watch the Superbowl together. I could feel myself looking for the door but fortunately she did not dwell too much on this topic and moved forward. I agree with her in that Second Life does have a place in education but I wonder if that level of immersion in the virtual world is necessary or even wise. Finally I am in a Book Club and have attended my first meeting this week. The book we read and discussed was Wicked but virtuous by Mirka Mora. It is an autobiography of the Melbourne artist. As someone who formally studied art and design in Melbourne I was embarrassed to admit not knowing of either her or her work. Having said that I discovered she is probably as good an artist as she is a writer, and that is “poor” in my opinion. The book was more of a memoir in the style of an unedited stream of consciousness. It lacked detail, information, and insight into her life and relationships. It was pretentious and parasitic in the way she loved to name-drop. I know of and really admire the work of other great Australian female artists such as Margaret Olley, Margaret Preston, Stella Bowen and Grace Cossington Smith. These were artists of substantial talent and contribution. Stravinsky’s lunch written by Drusilla Modjeska is a rich and brilliant exploration of the art, life and times of Stella Bowen and Grace Cossington Smith set alongside the happenings of Australian society at the time. It is a book I wholeheartedly recommend. The Book Club offers me a chance to broaden my reading outside my habitual tendencies. It also is a privilege to share our varied responses to literature and to hear the opinions and thoughts of others. It gives depth to my own limited ideas and notions. The things known about a topic beyond what is written in the book adds more to the story and discussion. Others in the group knew of Mirka Mora and her art and shared their tales. It served to enrich the experience and opened us all to more of Melbourne’s short history. Meanwhile at work our Book Club students competed in the annual Readers’ Cup Challenge. I helped judge the quiz where the teams answered questions about the four books they had read: What I was by Meg Rosoff; The red necklace by Sally Gardner; Town by James Roy; and One whole and perfect day by Judith Clarke. The girls had decorated their tables, responded to creative tasks by making colourful masks, and wedding dresses, and they had dressed up for the occasion. It was a fun activity and The Jane Austen Book Club won by a slim margin. 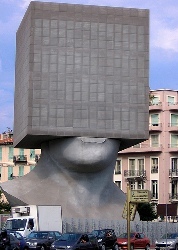 Driving through Nice in France I was surprised to see an extremely unusual building and then delighted to learn it is a library. Who else but the French would build such a quirky building? I love it. The busy tour schedule meant that I couldn’t get back to the library to walk around or go inside. Next time I visit Nice I will for sure. Meanwhile at our library we are preparing for the annual celebration of Children’s Book Week and the theme this year is Fuel Your Mind. The CBCA website offers promotional materials for sale to libraries, such as posters and bookmarks, however access and availability of these is limited. Often the graphics are directed towards a young audience and not suited to the secondary school students. So we produce our own signs, posters, and bookmarks. This year we have used the Nice library as the key graphic as it represents the theme of Fuel Your Mind perfectly. I can only admire and applaud the French creativity, ingenuity and courage for producing architecture such as this unusual library.